Many families in cities often send their pets to pet care services so that they can be away home for the Tet holiday. The recently-emerging service is popular in big cities including Hanoi, Ho Chi Minh City and Danang, where demand is high. Pet care centres in HCM City are very busy with lots of customers. Teddydog Shop on Vo Van Tan Street, District 3, charges higher fees for pet care on Tet with around VND400,000 ( USD17.39) per day for dogs weighing more than 15 kilos. Meanwhile, the fee is VND250,000 for dogs of below 15 kilos. Customers have been required to pay a deposit due to high demand. Puppy House has announced it is nearly full. The fee there ranges from VND100,000 to VND400,000 per day, depending on pet weight and service quality. However, the shop only receives pets which are in good health. Customers also have to show their pet vaccination book to the shop. At the shops, pets are provided with frequent medical check-ups and supervised by cameras round-the-clock so that their owners can see. The shops offer beauty services for pets such as bathing, nail and feather pruning with the fee of VND250,000 - 500,000 based on the animal weight. Pet care services in Hanoi lure many customers when Tet is nearing. 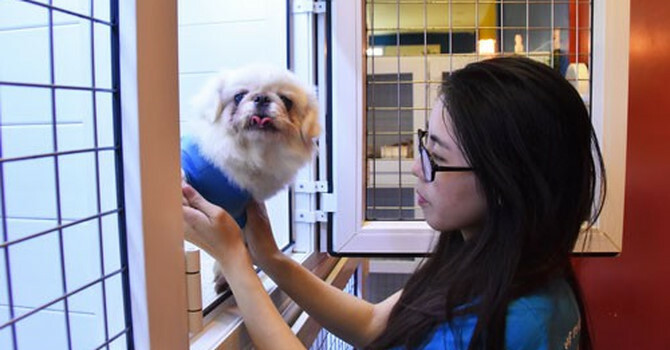 A pet shop in Thanh Xuan District said that the fees are raised by 7-10% on Tet. Nguyen Tung from Ba Dinh District said that he had to spent a total around of VND5.5 million for his dog which had just given birth to be kept during Tet.